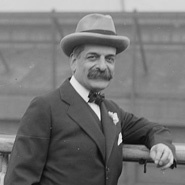 A member of a prominent German banking family, Felix Warburg immigrated to New York in 1894 and joined the firm of Kuhn, Loeb, and Co. Warburg married Frieda Schiff, daughter of Jacob Schiff, the firm's head, and remained a senior partner until his death. Warburg assumed a significant role in public affairs and the relief of world Jewry. He was commissioner of education in the city of New York, served on the board of Columbia University and was an early governor of the Hebrew University of Jerusalem. Warburg was a founder and chairman of the American Jewish Joint Distribution Committee, which was instrumental in providing aid to European Jewish communities after World War I, and was a major donor to the Jewish Theological Seminary (JTS). In 1944 the Warburg family's Fifth Avenue mansion was donated to JTS for use as The Jewish Museum.